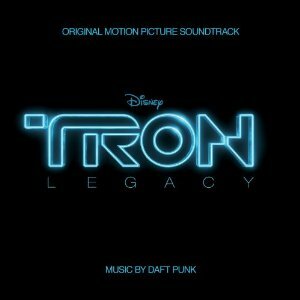 Since early this past summer the internet music community has been pretty excited to hear the new TRON: Legacy score from Daft Punk. The almost bi-monthly appearance of fakes only piqued interest further. A handful sample tracks finally dropped a few weeks in advance, but until I had the whole hour’s worth of music in my hands, I wasn’t satisfied. Even then, on the train ride home, I was worried that there was no way the actual product could live up to expectations. As it turns out, my concerns were unfounded: Daft Punk delivered in full on this score. Before we get there though, I wanted to take a quick moment to talk about the film to which this music forms the soundtrack. And to do that, we really need to talk about the original for a second. The original TRON film is pretty stupid. And that’s not to say I don’t love it, I do, and maybe ‘stupid’ is a little harsh… but it’s silly by today’s standards. The irony being, it’s only looks stupid today because it kick-started the age of CGI effects itself. Its cult-status stems from the cutting edge visuals, and a story just engaging enough to justify them. So it’s with that tidbit of history that we talk about the new film, TRON: Legacy. Almost universally praised for its visuals, the film is truly a spectacle. Though the story is not as clear or complex as some may have liked, it is a truly logical successor from its counterpart, which is a feat given the time between the production of the two films. But we’re here to talk about the music: I had never heard a Daft Punk album before hearing this score, so I felt pretty lucky to go into it with no prejudices or expectations. The work as a whole is fantastically tight and cohesive. I like some tracks better than others, but none are weak, and every single one is evocative of the other-worldly visuals which they accompany. The easiest influence to spot is Hans Zimmer’s Inception score’s signature brass (as well as the shout-out in the liner notes!). It pops up at climactic points, mixed at an unignorable volume, and accomplishes a similar end. A more subtle connection I drew is to Phillip Glass’s Koyaanisqatsi score, with TRON: Legacy’s ‘The Game Has Changed‘ containing a fairly strong allusion to Glass’s ‘Pruit Igoe‘, a fantastic and interesting track in its own right. Koyaanisqatsi was a film about the consequences of living in our increasingly industrialized world, and even featured a track called ‘The Grid,’ so I’ve got to give style-points to the Daft Punk folks if that was in fact the work they were referencing! There’s a great many more stand-out tracks as well. ‘The Grid’ on Legacy is notable for having Bridges’ narration over it, and serves as a pretty cool little expositional point at the start of the album. I like ‘Outlands’ because it has some of the most triumphant overtures in the entire work (most tracks are dark or aggressive). ‘Adagio for Tron’ (where ad agio is an Italian term meaning ‘at ease’, indicating the song is to be played slowly) and ‘Nocturne’ comprise the soundtrack for the flashback wherein Flynn relates how his perfect system became corrupted. If you’re familiar with the characters from the original, this is a reasonably emotional point in the film, and the music is fitting. This segues into the best scene in the film. The events at the End of Line club are the most polished of anything else in the movie. Michael Sheen’s performance of Castor was a delightful surprise, and maybe the only fun character in the film. Couple this with the solid action sequence interrupted by the deity-like arrival of Flynn, and this ended up being my favorite part. The tracks ‘End of Line‘, the infectious ‘Derezzed’, and ‘Fall’ offer a great triffecta to accompany the above. ‘Disk Wars’ has another glipse of Zimmer-esque build (think The Dark Knight score), while ‘C.L.U.’ covers the last battle. ‘Arrival’, ‘Finale’ and ‘Flynn Lives’ set the tone for the conclusion, offering maybe the greatest nod that the original score was going to see in the new soundtrack, and ‘Tron Legacy (End Titles)’ is a electronic version of the same idea to go over the credits. It’s a monumental piece of work. Without context of their earlier work, I can’t recommend that Daft Punk quit their day jobs, but if there was ever someone who could do so with impunity, it would be these guys. Pairing the duo to TRON: Legacy was a clever risk that paid off big. The outstanding question then becomes: does Daft Punk still have more to offer the world in terms of film scores?